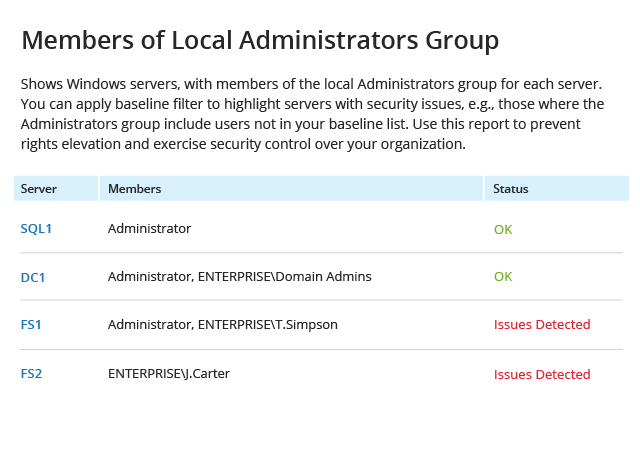 With native Windows Server reporting and auditing tools, it’s hard to find all the necessary information about what changes were made, who made them, when and where they happened. 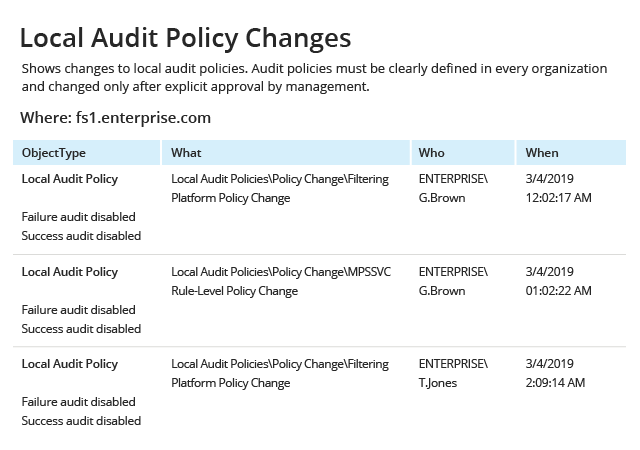 Netwrix Auditor delivers change audit reports on all critical Windows security log events, including changes to local users and groups, services, advanced audit policy settings, and critical servers like domain controllers, so you can quickly take action and remediate inappropriate changes before they cause real damage. 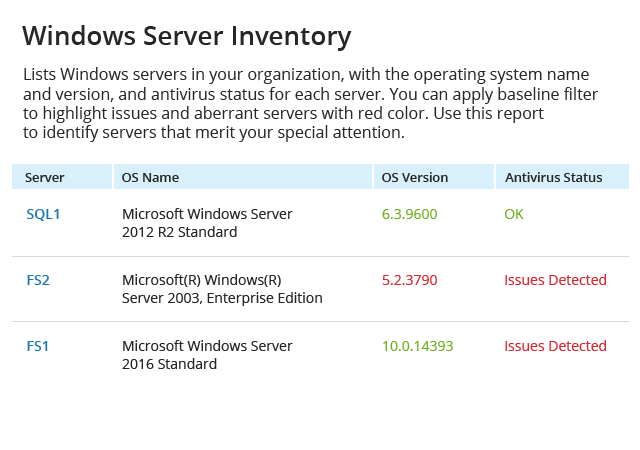 Netwrix Auditor simplifies regular Windows Server auditing by providing detailed reports on configuration status and any deviations from your known good baseline, such as outdated antivirus tools or harmful software. 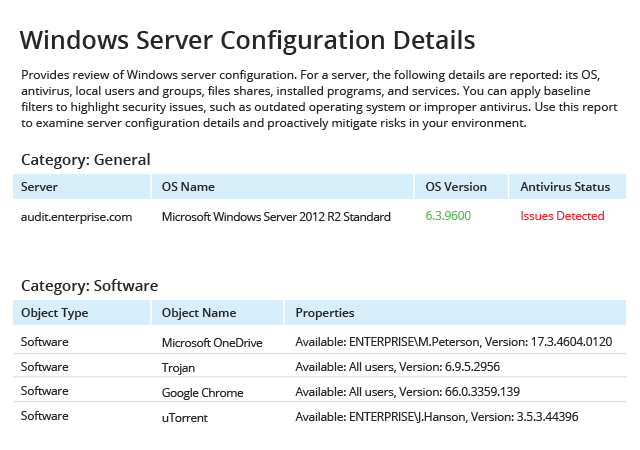 Remediate these IT risks in accordance with server management best practices. Using the native Event Viewer for auditing means scrolling through a ton of logs, so analyzing the security event log is usually very slow and difficult. As a result, unauthorized activities can go unnoticed and cause serious damage. 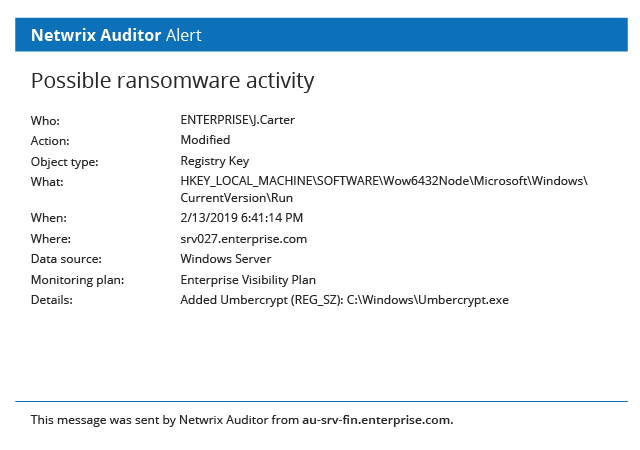 Netwrix Auditor notifies you about the Windows security events you configure as critical, like changes made to your registry startup keys, which could indicate a ransomware attack in action. Alerts provide detailed information about events, so you can respond fast and prevent a disaster. Being alerted about a specific event or when a threshold is exceeded is not always enough, since some threats are more complex, comprising multiple actions over a longer period of time. 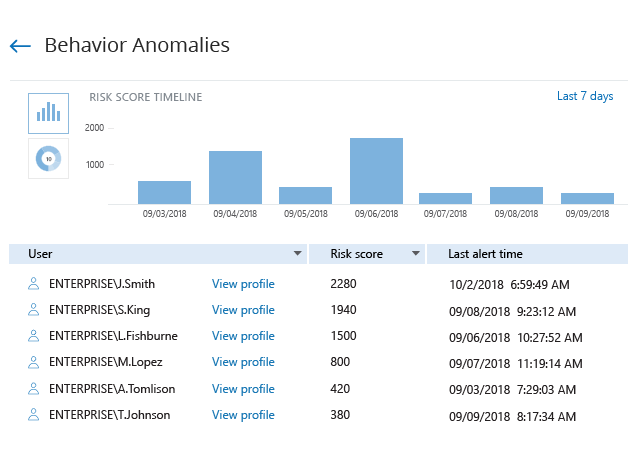 To notice such anomalies, Netwrix Auditor provides a single view of all anomalous activity alerts triggered by an individual across all audited systems, along with their cumulative risk score. This makes you more informed and ensures no threat actors go unnoticed. 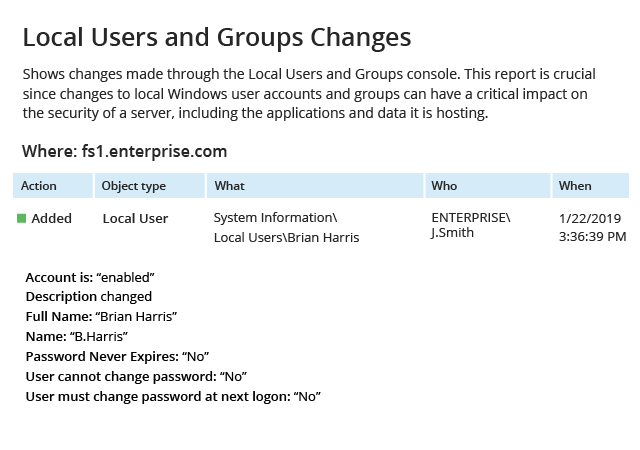 To secure your Microsoft Windows environment, it’s important to keep track of all unusual events, such as users logged on to their computers outside business hours. By regularly monitoring Netwrix Auditor’s User Behavior and Blind Spot Analysis reports, you can spot these subtle indicators of threats and investigate them before you suffer a breach. What if there were changes made to file share permissions or the Local Administrators group, or new software was installed? Such scenarios deserve attention and a proper investigation how it happened. 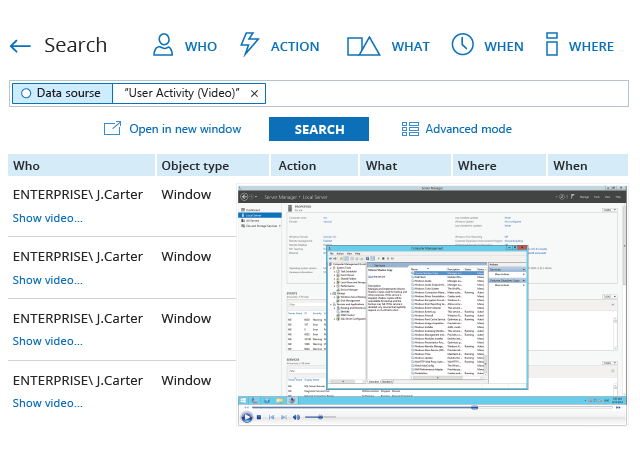 Newrix Auditor’s Interactive Search makes it easier to find answers to specific questions and get to the root of an incident. Moreover, you can create custom alerts based on your search requests and be notified about similar incidents in the future. To detect unusual spikes in user activity, you need a comprehensive view of changes. 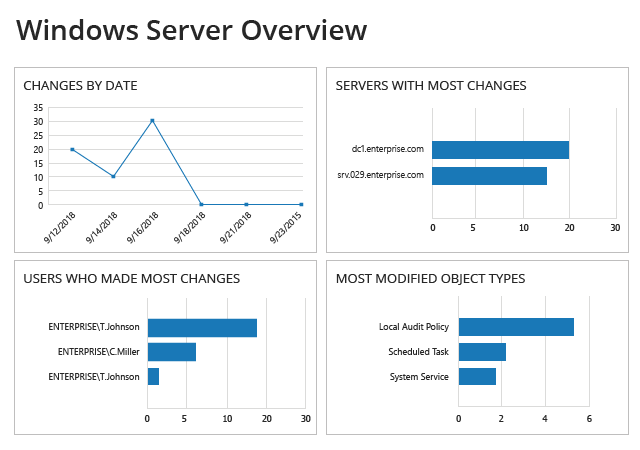 Netwrix Auditor’s overview dashboard enables you to see at a glance the user accounts that have made the most changes, the servers that are most frequently modified, the object types that are changed most often, and all spikes in change activity by date. Keep privileged users and other users with broad data access rights under close surveillance. Monitor their activity in any system or application, even if it doesn’t produce any logs. Use video recording technology and get notified anytime a user does something outside of their scope of activity. Even if you are storing all the audit data from your Windows servers, proving your compliance to auditors can still be a challenge. Netwrix Auditor streamlines Windows security auditing with out-of-the-box compliance reports mapped to the specific controls of PCI DSS, HIPAA, GDPR, SOX, GLBA, FISMA/NIST and other common regulatory standards, so you can successfully pass audits with less effort and expense. A RESTful API enables you to integrate various applications with the Netwrix Auditor platform. 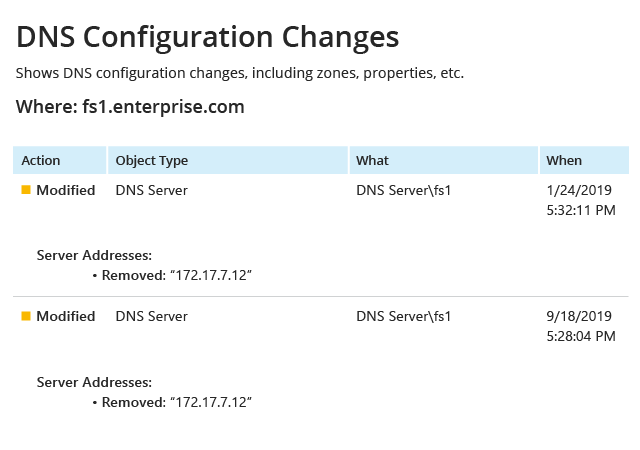 As a result, you can gain a single-pane-of-glass view into what’s happening in your IT infrastructure and networks, and have the entire audit trail available from one place. 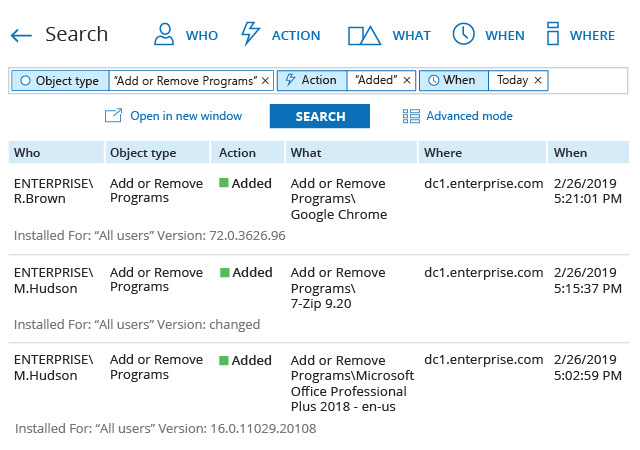 Free, ready-to-use add-ons are available for most common apps, including SIEM solutions. Netwrix Auditor helps you automate response to basic management tasks and anticipated incidents so you don’t have to handle them manually. For example, a user is generating multiple failed logon events, you can embed a script into alerts to automatically block that user. 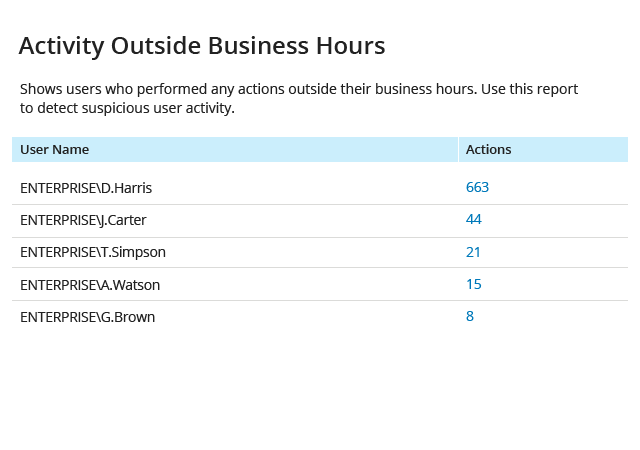 This functionality enables you to react faster and stay focused on more important tasks. Archiving the Windows Server audit trail for a long period is essential for some investigations and is required by some compliance requirements. With Netwrix Auditor, you can store your audit trail in a two-tiered (file-based + SQL database), cost-effective storage for more than 10 years, while enabling easy, secure access to the archived data for historic reviews and inquiries. 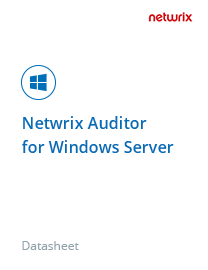 To make sure that your Windows Server auditing process is secure, Netwrix Auditor allows you to granularly assign the appropriate access rights to IT administrators or business teams based on their need to know. This critical feature facilitates productivity while ensuring strict adherence to the least-privilege principle. 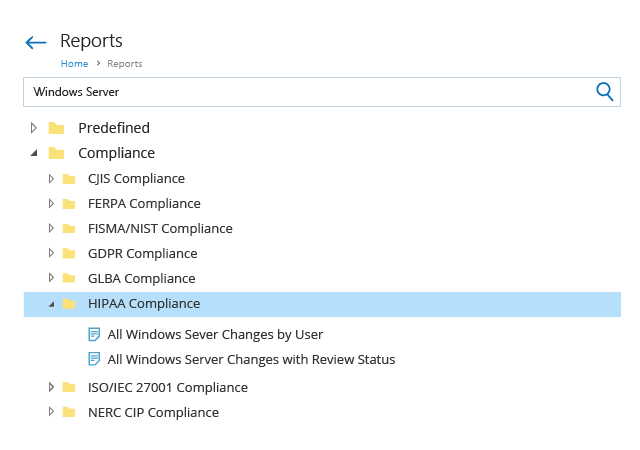 Find out how Netwrix Auditor for Windows Server can help you detect security threats, pass compliance checks with less effort, and improve the productivity of your IT teams. 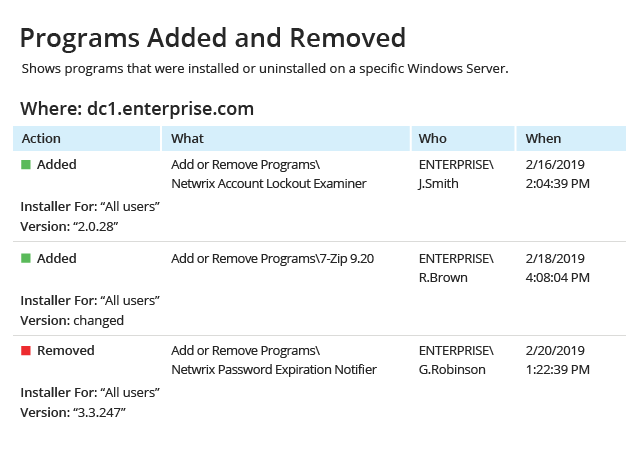 Use this handy list of features of Netwrix Auditor for Windows Server in a fill-in-the-blank format that facilitates comparing the product to your requirements.